Marcus Martin is a multi-award-winning author of dystopian thriller fiction. He began his career writing for stage and radio before turning his hand to novels. He's based in Cambridge UK and often draws inspiration from the cutting-edge research and discoveries being pioneered in the city. When first the International Space Station’s crew dies and then all Earth's satellites are wiped out, the powers that be realize something disastrous is about to strike Earth. With communications and power gone, the thin veneer of a civilized society rapidly begins to crumble as the citizenry begins to do whatever it takes to survive. Add in a pandemic that is rapidly culling the population and you have the premise for Marcus Martin’s dystopian novel, Convulsive Part 1. Lucy and her partner, Dan, are better placed than most to survive. Dan’s father, who is high up in the government, had already warned him something was about to happen and Dan had wisely stockpiled food and supplies to ensure their survival. As the civil authorities in San Francisco struggle to cope with the overwhelming problems, Lucy and Dan must survive at all costs until Dan’s father can organize a way out for them and others. 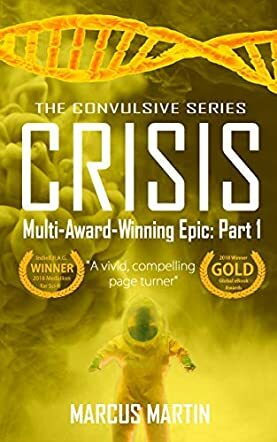 Convulsive Part 1 is the first part of a serialized set of novels, so as a standalone book it fails to answer many questions, but sets up very well the continuation of the story for the next installment. Although I’m not personally a great fan of this style of serialization, author Marcus Martin does an excellent job of building the action to a crescendo and leaving the reader wanting more, which at the end of the day is the whole point of this type of story. I liked Martin’s writing style, which is simple, straightforward, and rapidly moved the action along. The characters could well have been more deeply explored, especially the two principals, Dan and Lucy, as well as their relationship, but at the heart of the story is the dystopian battle for survival and, on that level, the author did a very good job of carrying the reader along at a steady clip. This is a good beginning to a series and I see Convulsive Book 2 is already available, so readers who enjoy this first part will not have to wait to find out what happens next, which is always a bonus.